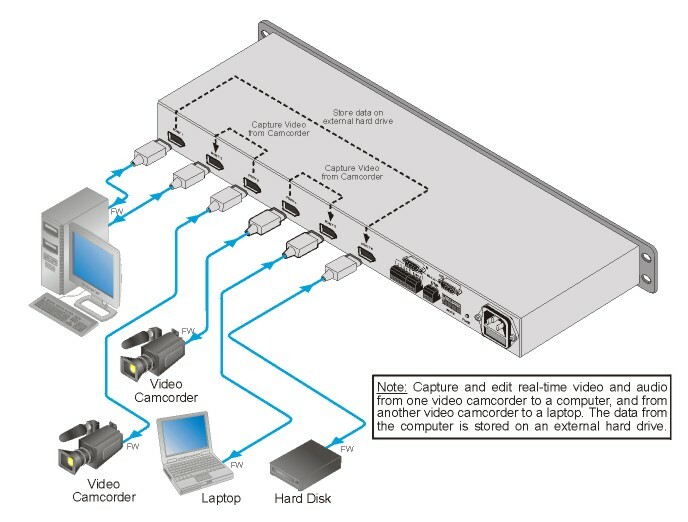 Video broadcast studios for high quality signal routing. Video production studios with Non-Linear editing systems. 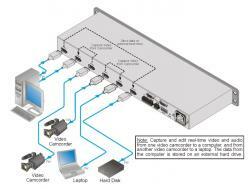 The VS?66FW is a high?performance bidirectional matrix switcher/hub for FireWire? (IEEE 1394 & 1394A) signals. It connects multiple ports to create standard branch/leaf groups. Transfer Rates - 100, 200, and 400Mbps. Control - Front panel, RS?232 (K?Router? Windows? ?based software is included), RS?485, contact closure, & IR remote (included). Worldwide Power Supply - 100?240V AC. Standard 19? Rack Mount Size - 1U. INPUT/OUTPUT:	6 ports on 6?pin 1394A connectors. STANDARDS:	Compliant with IEEE 1394?1995 and 1394A?2000 standards. BUS TRANSFER RATE:	Up to 400Mbps signaling rates for high?performance serial bus. SOURCED POWER:	12V 1.5A total for any one or all ports. CONTROL:	18 front panel pushbuttons and Kramer IR remote receiver on front. RS?232 In/Out on 9?pin D?sub F/M and RS?485 on detachable terminal block. INDICATORS:	6?character display on the front panel. POWER CONSUMPTION:	100?240V AC, 50?60Hz, 30VA. ACCESSORIES:	Power cord, null?modem adapter, Windows? ?based control software.